Our new reading group has gotten off to a great start. 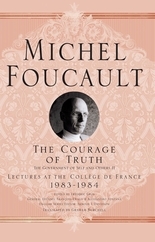 New members are still welcome to join our discussion of Foucault’s final lecture course, The Courage of Truth: The Government of Self and Others II: Lectures at the College de France, 1983-1984 (Palgrave Macmillan, 2011). Both meetings: 7:00-9:30pm at CUNY Graduate Center, Room 5409. If you would like to participate, please email Kevin Jobe, Reading Group Director: foucaultsocietyorg@gmail.com. We will cover one entire lecture (first and second hours) at each meeting, which will be held approximately every two weeks. The reading group is open to the public. New members are still welcome to join the group. Some familiarity with Foucault’s work may be helpful. In order to develop a productive dialogue, we ask that participants commit to attending most meetings. If you have questions or would like to register, please contact Kevin S. Jobe at foucaultsocietyorg@gmail.com. For table of contents and more information about The Courage of Truth, click here.